We are currently producing a new Local Development Plan (LDP) that will shape the growth and development of the Borough up to 2030. 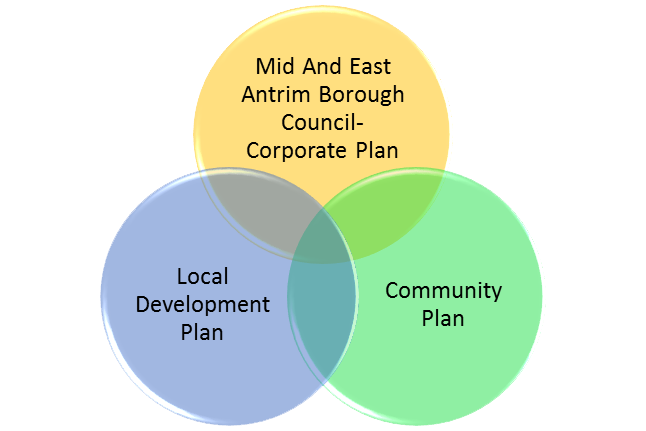 What is Mid and East Antrim Local Development Plan? Protect, and wherever possible enhance areas and assets that are enjoyed by our citizens and visitors. These will be prepared in the context of the Council’s overall Corporate Plan and wider government policy including the Regional Development Strategy and the Strategic Planning Policy Statement. The LDP will also take into account the Council’s Community Plan providing a spatial expression of the Community Plan and thereby linking public and private sector investment through the land use planning system. What is the current stage of plan preparation? The Council has already undertaken a wide range of preparatory studies and will continue to further update and review the evidence base. This involves the collection and analysis of information relating to a number of topics that the Plan will address. We have also undertaken initial consultation with a range of statutory consultees. This evidence base will provide a robust foundation for the development of Plan policies and proposals. Our Preferred Options Paper (POP) was published on 14 June 2017, and a POP Public Consultation Report was published in November 2017. How can I get involved in the preparation of the Plan? Information on how you can become involved in the preparation of our Local Development Plan 2030 is contained in our Statement of Community Involvement. If you would like to be kept informed of progress on this plan, please complete and return our Community Involvement Form. There will be a number of events and activities arranged during the preparation of the new plan, to give everyone an opportunity to share their views and become actively engaged with the development of plan policies and proposals. We will advertise details of any forthcoming events and activities on this page.